Marciana, situated on the slopes of Monte Capanne, is a quiet hilly town on the west side of Elba Island. It is one of the oldest settlements on the island, its foundations dating back to 35 BCE. Nestled in greenery of oak, pine and chestnut trees and enjoying the freshest of air, the Marciana area exudes a special atmosphere with a mountain-like climate although the sea is only five kilometers away. First stop is the striking Pisan Fortress, once used by locals as a refuge during pirate attacks, now a distinguishing mark of the town’s highest part. Check out the two churches: the Romanesque Parish Church of San Lorenzo, destroyed by the Turks in 1554 and now acknowledged as a national monument, and San Cerbone, erected in homage to the saint who retreated here from Populonia in the 6th century to escape persecution from the Longobards. History lovers will love the Archaeological Museum, home to the prehistoric and protohistoric relics of Elba Island, in addition to finds dating to the Etruscan and Roman eras. The lovely medieval village of Poggio Terme is worth visiting. Surrounded by oak and chestnut forests, drink from the Fonte di Napoleone, a natural mineral water spring once enjoyed by the emperor during his exile. The water is recommended as a cure for uricemia and kidney stones – there’s even a bottling plant, although you can drink for free from the fountain. The highest point on the island, Monte Capanne is the area’s most distinctive hallmark. Rising more than 1,000 meters, you can reach the mountain by foot from Marciana along paths marked by Club Alpino Italiano or by taking the cable car in the summer. Fun fact: amazing tormaline and beryl crystal rocks are extracted from Monte Capanne. On the north side of the mountain, the Madonna del Monte Sanctuary is worth a look. A place of worship since the 1300s, the current shrine was built in 1595 and took on its current appearance in 1799. 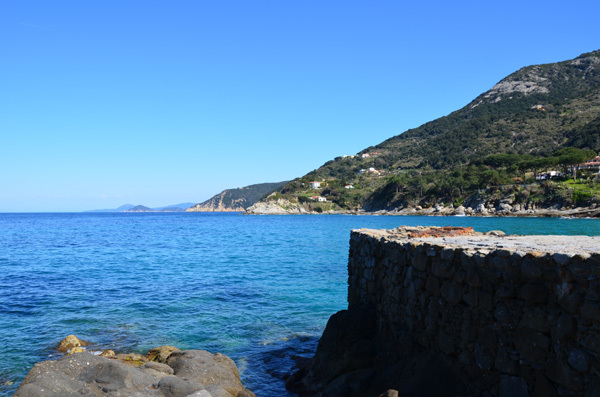 Like the rest of the island, the Marciana area is bursting with stunning beaches, such as the sandy stretches at Paolina, Procchio and Spartaia, the sand and reefs of Sant’Andrea; the reefs of Punta Nera and Chiessi, and the rocks and gravel of Pomonte and Patresi.